French President Nicolas Sarkozy (R) escorts German Chancellor Angela Merkel. Photo: Reuters. Paris/Berlin: Pessimistic comments from EU paymaster Germany and new figures exposing growing stress among Europe’s banks took the shine off financial market hopes of a turning point in the euro zone debt crisis at a summit this week. “I have to say today, on Wednesday, that I am more pessimistic than last week about reaching an overall deal ... A lot of protagonists still have not understood how serious the situation is," the official said. “My pessimism stems from the overall picture that I see at this point, in which institutions and member states will have to move on many points to make possible the new treaty rules that we are aiming for," he said, speaking on condition of anonymity. The euro slipped, European share prices turned negative and safe-haven German bond futures rose after the official dented investors’ hopes of a comprehensive solution. US treasury secretary Timothy Geithner, whose fourth trip to Europe in as many months speaks of the alarm in Washington at the damage the debt crisis could wreak on the US economy, backed the Franco-German plan to impose mandatory penalties on euro states that exceed deficit targets. “I have a lot of confidence in what the president of France and the minister are doing, working with Germany to build a stronger Europe," Geithner told reporters after talks with French finance minister Francois Baroin. “Neither Nicolas Sarkozy nor Angela Merkel will leave the negotiating table of this summit until there is a powerful deal," Baroin told Canal+ television. The European Central Bank’s governing council holds a crucial meeting on Thursday, before the EU summit, at which most economists expect it to cut interest rates to 1% from 1.25%, introduce longer-term liquidity tenders for banks and widen the collateral they can use to borrow from it. 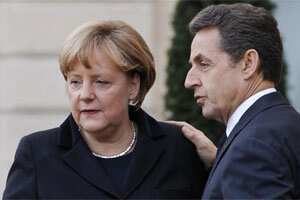 Two days before the summit, new ideas bubbled about how to boost the euro zone’s crisis capabilities. EU officials said leaders could decide to raise the combined lending limit of the temporary EFSF rescue fund and its successor, the permanent European Stability Mechanism, which France and Germany want introduced a year early, in 2012. But the German official said he could not foresee running the two funds simultaneously. He also objected to talk of issuing common euro zone bonds as a longer-term solution.